CubMakr – online custom cub validation file generator. This is a quick demonstration of the new CubMakr Version 2 features. It covers custom ICE naming, integration with your application tracker and custom ICE routines. Last week we released CubMakr V2, with a few new features. You can find a quick video here. If you’ve already created your rules you can edit each rule and change the name accordingly. This is useful so that you can refer to specific ICE messages like you can with normal MSI validation (ICE33, ICE03 etc). It also means you can set up a web page with references to your custom ICE messages and instructions on how they can be resolved. Unfortunately, the HelpURL part of the ICE message no longer appears to be supported by most products so we can’t include this in the CubMakr toolset (sad face). The second new feature in Version 2 is Advanced Scripting. This is really interesting, as it enables advanced users to include their own custom VBScripts into the cub files. These scripts can be used to perform custom ICE routines (which cannot be handled by CubMakr natively, such as detecting empty components) and even integrate with your own application tracking tools for real-time validation!! The scripts can be sequenced to run before the CubMakr rules, or after the CubMakr rules. An example of advanced scripting can be found here. 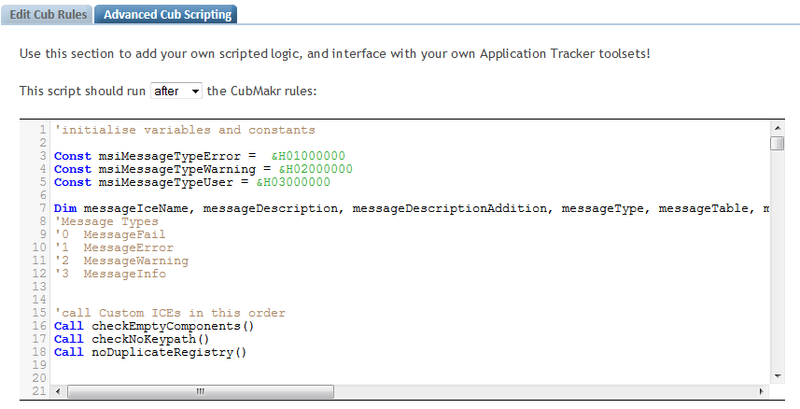 I thought I’d give a quick example of how advanced users can utilise advanced scripting in CubMakr. The first example I want to show is how we can integrate the CubMakr with your in-house tracking tool. 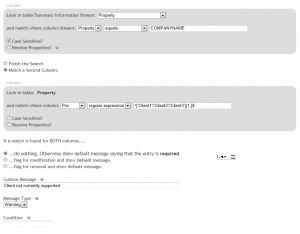 Some places use Sharepoint to track applications, some places use a SQL Server back-end (ok…so does Sharepoint….but I believe the preferred approach for querying Sharepoint is to use CAML and you can find a VBScript example on my blog here). In order to link your package to your tracker record, you’ll need a reference. In this example I create a property in the MSI called ALKANEREF and set the value to the unique reference for my package. In the script, I read the value of ALKANEREF and then query the SQL Server database to retrieve various records (vendor, application and version). I then create a session property (i.e, not a property which will persist in my database) called ALKANEMANUFACTURER which we can then use as part of a CubMakr rule to validate (for example) the Manufacturer property value. Dim packagevendor : packagevendor = ""
Dim packageapplication : packageapplication = ""
Dim packageversion : packageversion = ""
Dim sql : sql = ""
'not a property which has been created in the current in-memory session. 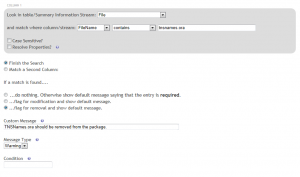 .CommandText = "SELECT * FROM packages WHERE packagereference = ?" 'set ALKANEMANUFACTURER for our CubMakr rule. Remember that Session.Property is read/write, Session.ProductProperty is read only! 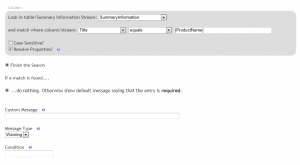 messageDescription = "'' is an empty component. Please delete." 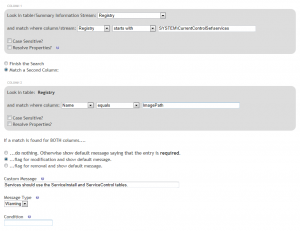 Dim tempComponent : tempComponent = ""
componentsRec.StringData(0) = messageIceName & Chr(9) & messageType & Chr(9) & messageDescription & Chr(9) & "" & Chr(9) & messageTable & chr(9) & messageColumn & chr(9) & ""
'This function checks for components without a keypath, and if a keypath is available, suggests it. 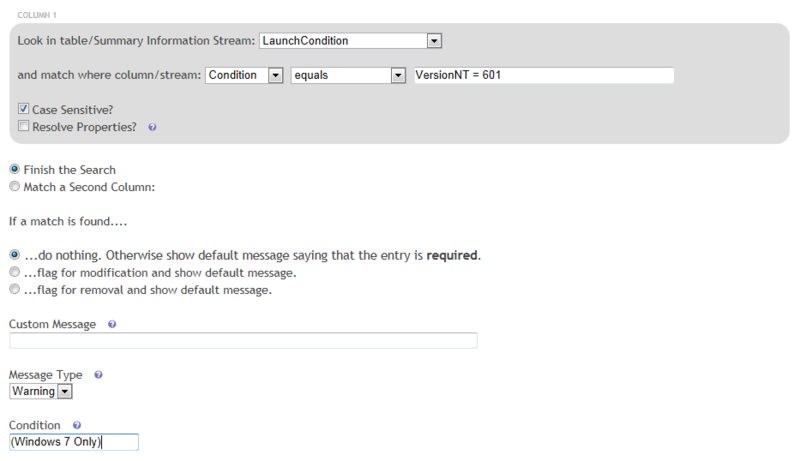 messageDescription = "Component '' does not have a keypath set." messageDescriptionAddition = " No suitable keypath entries were found." messageDescriptionAddition = " A suitable keypath may be '" & tempRec.StringData(1) & "' in the File table." 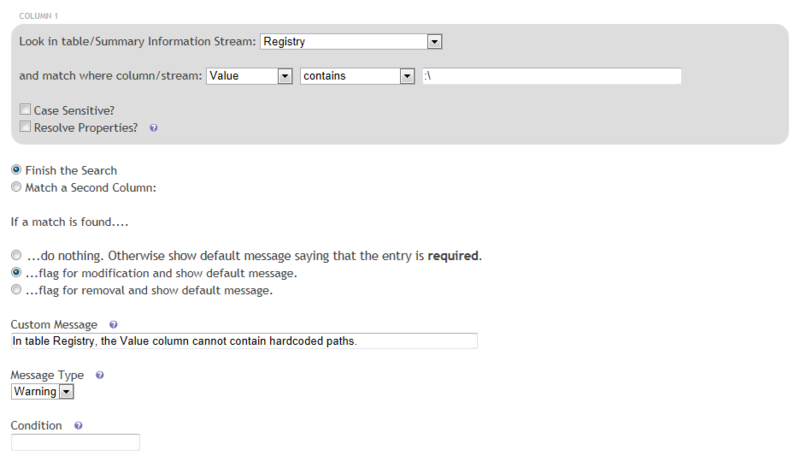 messageDescriptionAddition = " A suitable keypath may be '" & tempRec.StringData(1) & "' in the Registry table." messageDescriptionAddition = " A suitable keypath may be '" & tempRec.StringData(1) & "' in the ODBCDataSource table." keypathRec.StringData(0) = messageIceName & Chr(9) & messageType & Chr(9) & messageDescription & messageDescriptionAddition & Chr(9) & "" & Chr(9) & messageTable & chr(9) & messageColumn & chr(9) & ""
'registry and they're not being careful! messageDescription = "Registry entry '' is a duplicate of registry entry '" & duplicateRecord.StringData(1) & "'. Please investigate." registryRecord.StringData(0) = messageIceName & Chr(9) & messageType & Chr(9) & messageDescription & Chr(9) & "" & Chr(9) & messageTable & chr(9) & messageColumn & chr(9) & ""
This is a quick (kind of) demonstration of the CubMakr online tool. It goes through a few examples of how cub files can be generated easily without any scripting knowledge required. This page takes us through some quick examples of CubMakr detection examples. It includes examples using different search methods (‘equals’,’starts with’,’contains’,’regular expression’), resolving proerties, performing case-sensitive searches and using conditions. 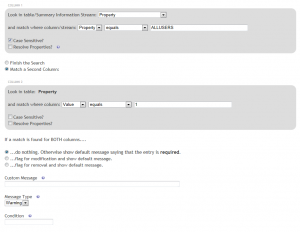 Example 1: Perform a case-sensitive search for a property name. If property/value is missing, display a warning message. Check: Check that the ALLUSERS property is set to 1. Example 2: Use the ‘contains’ comparison and flag for modification. Check: Check the the Value column of the Registry table does not contain hard-coded paths. Example 3: Use the ‘equals’ comparison and flag for removal. 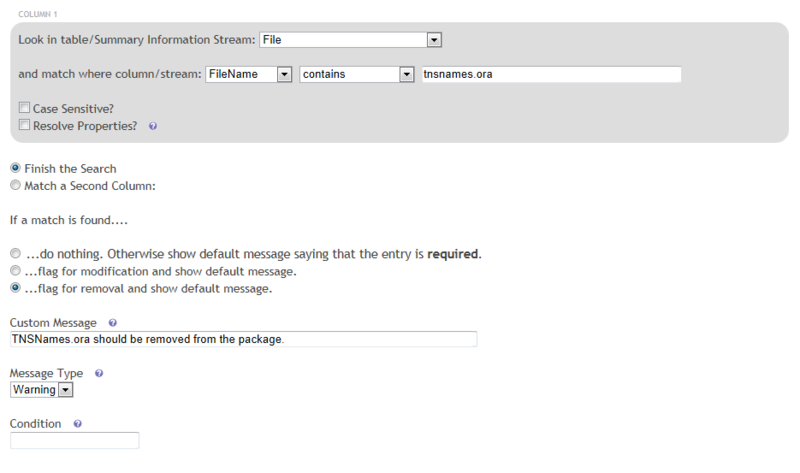 Check: Check the TNSNames.ora is not in the package (Files such as this are usually managed outside the package). Example 4: Use the ‘starts with’ comparison. 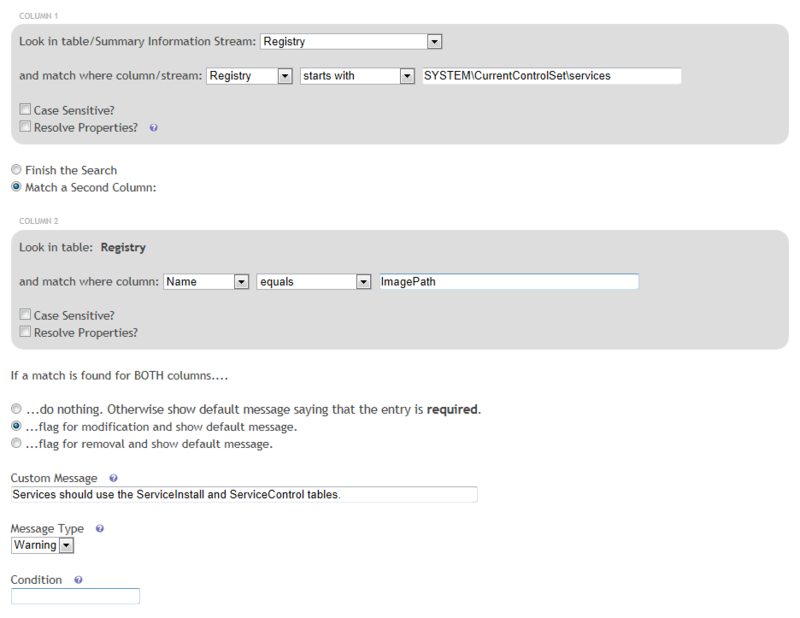 Check: Check that services use the ServiceInstall/ServiceControl tables, and not the registry. Example 5: Use a case-sensitive regular expressions to check for the presence of multiple values. 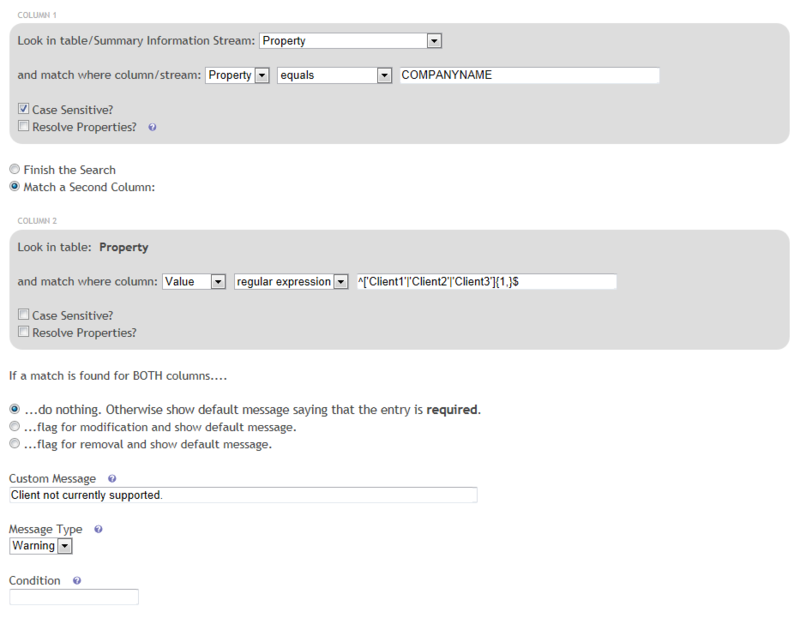 Check: Use a regular expression to ensure that the COMPANYNAME property is one of our supported clients. Tip: Use the following regular expression examples to construct your own searches. Example 6: Use the ‘Resolve properties’ setting to resolve a property value. 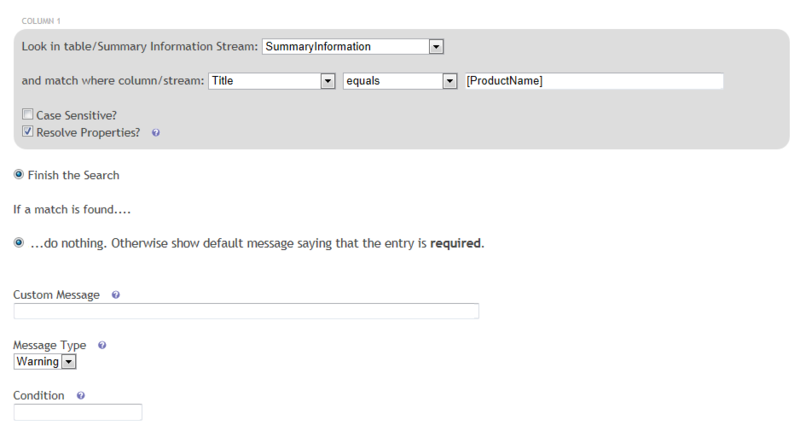 Check: Check that the Summary Information Stream Title value is the same as the ProductName property value. 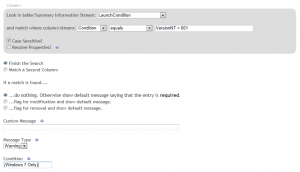 Example 7: Use a condition for the validation rule. Check: Check that a launch condition is set. Add a condition specifying that this rule is only valid when validating packages targeted at Windows 7 platforms. When creating MSI packages we should always ensure that they conform to Windows logo standards and best practises. Adhering to these standards enables us to produce more reliable and well-authored MSI packages. To perform this compliance check, we usually validate our MSIs using the Full MSI Validation Suite. What this validation process does is validate the MSI tables against certain rules which are specified in a .cub file called darice.cub. As a result of running this validation, we may be prompted with ICE warnings/errors which we should attempt (in most cases) to resolve. Some of our clients use Custom Actions to perform certain logic, and we must ensure that these are present in every package we deliver. Some of our clients use specific naming conventions for things like the ProductName property. Some like to limit the number of periods in the ProductVersion. We like to check that our tables do not contain hard-coded paths, that we only append to (and not overwrite) the Path environment variable, that services use the ServiceInstall/ServiceControl tables and not the registry table, and that TNSNames.ora is not included with any package. But how can we perform these validation checks when we have no scripting knowledge, and no knowledge of .cub files? Easy – that’s where CubMakr comes in. Set conditions for each validation rule! Display warning, error, info or failure ICE messages! 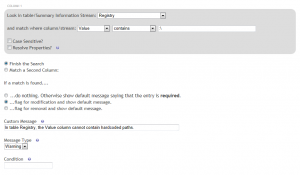 Re-order the rules you create, so messages are displayed in a specific order! Check that files exist/don’t exist – for example, ensure that files such as TNSNames.ora/hosts/services are not captured. Since the first release is just a BETA (to see if people find it useful), we have not included a way of saving cub files and retrieving them at a later date. Unfortunately whatever cubs you generate are only persistent for the current browsing session. The long term goal would be to enable people to save cubs for each client/project. Hopefully somebody will find this useful. If you do, please feel free to comment.